If the last few years have taught me anything it’s this: the one thing you will need more than anything else – more than even proper research and interview preparation - is resiliency. Resiliency is the winner’s edge in this, or any market. “Winning is not a sometime thing; it’s an all the time thing. You don’t win once in a while; you don’t do things right once in a while; you do them right all the time. Winning is a habit”, so says Vincent Lombardi, football’s winningest coach. re·sil·ien·cy –The act of resiling, springing back, or rebounding; as, the resilience of a ball. For our purposes, resiliency quite simply is the ability to take disappointment or “take a hit” as Vince Lombardi would say, and get up, and keep going. You know full well that if you were at work and you ran into an obstacle that prevented you from launching a new product or reaching a key client for information that was going to help you be more successful on the job, you’d find a way around it or through it. Put another way, if you found out you had the winning lottery ticket in your hand with fifteen minutes left to claim the $2 million you’d find a way to do it – even if you had to walk up hill in a snow storm – both ways - with a leg cast on! Your job search is no different and no less lucrative (40 yrs x 50K = $2 million). This is your life. Take complete charge of it. Develop your plan and then start implementing it with resiliency. Parlay your series of jobs into a purposeful career. Compliments of David E Perry and Kevin Donlin. 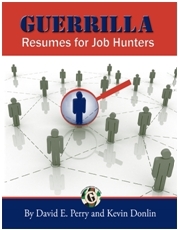 For more creative job search tactics, go to the Guerrilla Marketing for job hunters blog and download the free audio CD.